The 800 MHz model had a Maximum OS of 10.4.11. 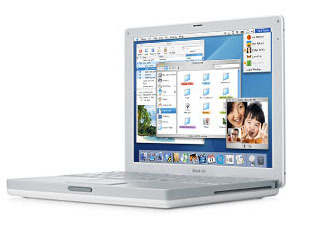 The 14.1"/1.0 GHz model consumed 51 W of power, weighed 5.9 pounds, and had the following dimensions: 12.7" W x 10.2" D x 1.35" H.
Introduced in October 2003, the iBook G4 was the final piece in the transition from the G3 to the G4 processor. In addition, the iBook G4 included a slot-load Combo drive, better graphics, USB 2.0, AirPort Extreme and Bluetooth support, a faster bus and memory architecture. The iBook G4 shipped in 3 configurations: 12.1"/800 MHz/256 MB/30 GB/$1,099, 14.1"/933 MHz/256 MB/40 GB/$1,299, and 14.1"/1.0 GHz/256 MB/60 GB/$1,499. All models were discontinued in April 2004.